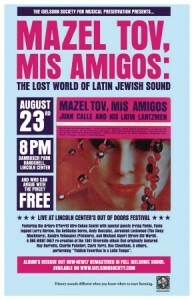 The Idelsohn Society will be closing out Lincoln’s Center’s Out of Doors Festival with a re-creation of the 1961 Riverside album, MAZEL TOV, MIS AMIGOS on August 23rd. The ONE NIGHT ONLY show will feature Arturo O’Farrill and his Afro Cuban Sextet with special guests Irving Fields, Fania legend Larry Harlow, the Antibalas horns, and others. The Idelsohn Society for Musical Preservation is also proud to announce that we have acquired an extensive back catalog from Orrin Keepnews’ legendary Riverside Label, which featured some of the greatest names in Jazz from the 50s and 60s. Our first re-issue, MAZELTOV, MIS AMIGOS (to be released August 11th) interprets classics from the Yiddish theater through the leading Latin dance styles of the 50s and 60s. MAZELTOV, MIS AMIGOS, digitally remastered for the first time by Fantasy Studio engineer Joe Tarantino, opens a time capsule to one of New York musical history’s great lost stories, the story of the Jewish Latin craze. When the entire country caught Mambo-mania in 1948, Jews religiously became the genre’s earliest adopters. Humorist Harry Golden once said that the history of Jews in America is the history of “sha sha” (Yiddish for hush hush) becoming “cha cha.” And he was onto something. This album comes on the heels of comic Irving Kaufman unleashing “Moe the Schmo Takes a Rhumba Lesson,” Irving Fields attacking with his “Havana Nagila,” bawdy balladeer Ruth Wallis declaring “It’s A Scream How Levine Does The Rhumba,” and Tito Rodriguez and Tito Puente capturing the Jewish musical imagination at the Palladium, Grossinger’s and the Concord. MAZELTOV, MIS AMIGOS is set for release August 11th (distributed by Nail and Ioda) it features 11 tracks, accompanied by Josh Kun’s extensive liner notes and a gallery of images from archives across the country which have to be seen to be believed.